Based on the thinking of Japanese style acupuncture, Fumi generally tries to bring a balance to the person as a whole in the beginning of the treatment session, then moves onto specific local areas that need an extra attention at the given moment. She generally spends a good amount of time to listen to the patient at each session, and the majority of a treatment session is done in a hands-on style. 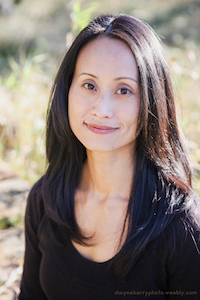 She combines various axially modalities in addition to needle acupuncture including moxibustion, cupping, Tuina massage, gua sha, Teishin, Sotai movement therapy, electro-current therapy, dietary & supplement education, and Qi Gong therapy to customize her treatment in order to achieve the optimal guidance for the individual patient. Additionally, she is also a certified practitioner for NAET (Nambudripad's Allergy Elimination Techniques) and Applied Kinesiology. With NAET treatments, she hopes that she can help patients with complicated and/or severe allergies and sensitivities, which significantly affect quality of life for many. Native from Japan, Fumi has been enjoying living in Oregon for over two decades. Before choosing the path of Oriental Medicine, she practiced a various styles of yoga including Astanga and Shadow Yoga for years and completed a 3-year yoga teacher training at Yoga Shala in 2009 with Matt Huish. Having worked in corporate environments, Fumi understands how easy to get into a potentially self-destructive habitual pattern. She hopes to bring her treatments to help people who seek for a transformation toward more grounded perception and receptivity in order to enjoy their lives more deeply while enhancing individual's innate healing capacity. Fumi graduated from Oregon College of Oriental Medicine with an MAcOM and also holds an MA in Asian Studies from University of Oregon. While she is not engaged in medicine and healing, she enjoys rock climbing, yoga, qigong, being in the nature, craft work, sewing, cooking and calligraphy.